The capital of Costa Rica is the city of San José, which has 340,000 inhabitants and is centrally located. Located on a plateau just under 1,200 metres above sea level, the metropolis was designated as the seat of government by Costa Rica's first democratically elected head of state in 1824. The city itself has retained its charming character for almost 200 years. It offers travellers from all over the world numerous impressive buildings and is the starting point for discovery tours in a unique tropical landscape. Exotic nature parks with unique fauna and flora invite you to visit all over Costa Rica. A few kilometres away from San José, a volcano and its two crater lakes want to be visited. You start your holiday in Costa Rica in the capital San José, as you will probably arrive at the international airport called Juan Santamaria. Probably you want to explore the beauty of Costa Rica with an already reserved rental car. On our portal you have provided the car with all necessary accessories at a reasonable price, you can rent it and only have to pick it up at the pick-up station of your car rental company at the airport. Read the following information about San José Airport, we will explain the location of your chosen car rental company and tell you where to pick up your car. Actually, San José's international airport is located near the town of Alajuela, about 20 kilometres west of the capital. As the largest airport in Costa Rica, it brings the most visitors to the country. It was commissioned in 1958 and received its current name 23 years later after the national hero Juan Santamaria. Since then, the IATA code of the airport has been SJO. How long do you want to use the rental car and how many kilometers are you going to cover? Do you need accessories such as child seats or navigation systems? What insurance coverage should be specified in the rental agreement? Are you comfortable with the tank control of your favorite car rental company? If you clarify these criteria at the time of booking, it will also be easy to manage the rental car transfer at San José Airport. After landing, you will arrive at the airport's arrivals hall, take your luggage off the treadmill and reach the counter of your car rental company in just a few steps. Friendly employees with a ready-made rental contract await you there. Please make sure that you rent your car not only at a reasonable price, but also with all the special wishes mentioned. If the rental agreement is correct, please sign and inquire about the location of the pick-up station. Every car rental company has its own pick-up station at Juan Santamaria Airport (SJO), which must also be used to return the car. The pick-up station is usually located outside the arrivals hall on one of the parking lots. According to our experience, the shuttle buses operate in very irregular intervals and the transfer to the pick-up station usually takes place after calling. The drivers know exactly where the rental car stations are located and place their passengers correctly, but there is often no signposting for people who are unacquainted with the area. Once you have found your chosen rental car at the station, you will need to take a close look at it. Please check all control elements and, in particular, the functioning of the brakes. You should also take a look at the fuel gauge, after all you take over the car and have to return it in the same condition. Finally, an optical inspection should be carried out to check for old scratches or dents. In your own interest, please have all complaints noted in a list of defects and keep a copy for yourself. If any deficiencies found impair road safety, you should demand an equivalent replacement from your car rental company. However, the reasonably priced rental cars at San José Airport are usually in very good condition and can be easily taken over by any car rental company. More than three million passengers arrive or depart from San José Airport (SJO) every year. Most of the arrivals want to get to know Costa Rica and rent a car. The enormously high demand, especially during the peak travel season, is met by only eight companies in the car rental segment. Accordingly, the prospect of renting a car on arrival is relatively low. After a tiring long-haul flight, you'll have to walk from one car rental company to another to find a car rental that suits your needs. If you finally have a car in prospect, a rental agreement must be drawn up with your cooperation and according to your ideas. Depending on the time of day, minutes or hours may pass before you can finally take the shuttle bus to the pick-up station. We therefore advise you to rent your rental car on our comparison portal with all the desired extras at a reasonable price. In this case, your holiday in Costa Rica starts at San José airport. Is there a petrol station at San José Airport (SJO)? Yes, a petrol station is located in Avenida 11 731, not far from the terminals and is open 24 hours a day. If you have chosen the "full tank" option, the car rental company has handed over a full tank of fuel to you and expects you to fill up the tank at the pick-up station before you return. For your own safety, please contact the car hire company. Rental car driving requires a lot of attention from you in Costa Rica because there are well developed roads or highways only near the capital. In rural areas, sand and gravel roads still dominate the scene, there are paved roads, but they are often in poor condition and littered with potholes. If you want to visit the natural beauties of the country, you should ideally opt for an all-wheel drive rental car. Which speed limits do you have to observe? Is there a minimum age limit for renting a car in Costa Rica? Yes, before you rent a car cheaply, please consider the mandatory minimum age of 21 years. Make sure that there are comparatively few petrol stations in Costa Rica, and make sure that you check with your car rental company at San José Airport (SJO). The city centre of San José can be reached within 20 minutes from the airport via Autopista General Canas. Your rental car will bring you to Puerto Limón within two hours from here to the Caribbean coast. Alternatively, you can head for a real tropical paradise 60 kilometres away from San José: Puerto Quepos, located in the south of the capital. 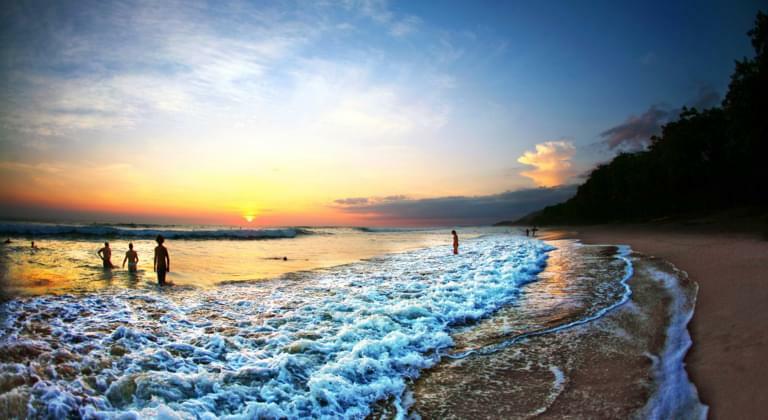 Montezuma and Puerto Viejo are also worth a visit. On the multi-lane road, make sure that the locals overtake both left and right. The Braulio Carillo Nature Park, located near the capital San José, offers you pure wild nature. Leave your car parked at the airport and glide with the jungle railway through the individual vegetation zones. A further natural beauty awaits you north of San José: the volcano Poas with its two crater lakes in fascinating turquoise blue. You can drive your rental car on a road almost to the crater rim. At the end of your stay, you drive the car, which you could rent for a reasonable price, to the airport San José and fill it up at the above-mentioned petrol station. Returning a car is no problem at any airport car rental company, as long as you haven't caused any new scratches and can prove old shortcomings with the help of the list of defects. After check-in, the shuttle bus will take you to the departure terminal, but plan the above-mentioned irregularities with regard to the timetable so that you can check in on time.